Like chili cheese fries, but healthier, and no drive to the fast food place. This is such a quick and easy dinner. The potatoes are microwave-cooked. The chili and optional bacon are leftovers. And the rest comes together in a flash -- I think the most time-consuming part is scrubbing the potatoes. These are a huge hit with my family, as it's a cross between home-cooking comfort food and diner fast service. Pierce potatoes all over with the tip of a knife. Microwave on high, 2 to 4 minutes per potato, until cooked (check after the minimum time). In my microwave, I do 5 potatoes, on HI, for 9-12 minutes. I begin checking after about 8 minutes, and remove any potatoes that have softened. Then continue cooking until all potatoes are done. **Microwave time will vary according to potato size and microwave wattage. Split potatoes lengthwise, and squish to open. Add salt and butter, if desired. Top with a couple of large spoonfuls of hot chili (so it pours over the sides), some grated cheddar cheese, and spoonful of chopped onions or scallions. Pop back in microwave for 40 seconds, to thoroughly melt the cheese. Optional -- if you want over-the-top-potatoes, crumble one slice of bacon over each. Super simple supper for my hungry family. Do you have a favorite super simple supper? Sounds tasty! I've always thought a potato bar would be a fun and easy meal at a party--baked potatoes with different toppings like chili, cheese, bacon, etc. A potato bar would be a fun menu for a large gathering. Everyone could pick and choose just how they wanted theirs. Great idea! Here is wishing some snow your way :) With such a wintry day I decided to make chili for dinner and to freeze the leftovers. I haven't tried it over a baked potato before, will have to try that - even mashed! Enjoy your wintry landscape! The first snow is always so exciting, especially when it falls in the weeks leading up to Christmas! We're coooooold here, but it looks like no snow till next week for us. Chili is one of my favorite winter dinners. Try it over a baked potato sometime. I think it's really great! 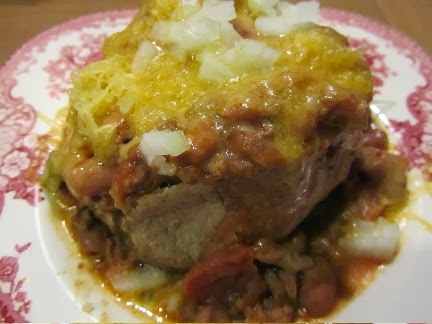 Love chili over baked potatoes. I don't do cheese, but could see some onions and bacon. Or even a bit or yogurt or sour cream. Yum, plain yogurt or sour cream would be really delicious and creamy. Baked potatoes would be great for a crowd, giving everyone choice in how to top their own! Cooking for 25 people much have been a challenge. It's a good thing that it's bulky sweater season here, as we've had these potatoes several times now!